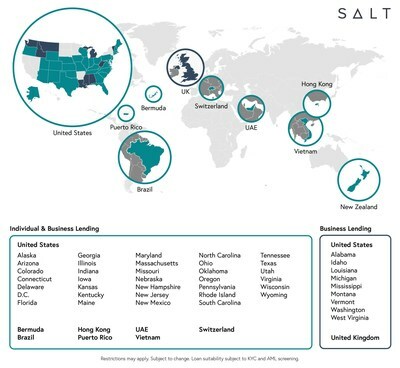 DENVER, Sept. 18, 2018 /PRNewswire/ — SALT, the world’s premiere provider of cryptocurrency collateralized Blockchain-Backed Loans™, today announces its most significant expansion to date, opening operations in 15 additional U.S. jurisdictions including New Jersey, Massachusetts, Washington and Texas, as well as an additional 7 territories including Brazil, Hong Kong, Switzerland, Bermuda, Vietnam, Puerto Rico and the United Arab Emirates. This rapid expansion of services comes on the heels of SALT’s 20-state expansion in August as the company approaches its goal of being fully operational in all 50 states. For more information on SALT’s continued expansion and services, including a full list of operational territories, see their recent blog post. SALT is the smart way to leverage blockchain assets—ingeniously linking cryptocurrency with traditional finance. Through its membership-based borrowing platform, SALT allows cryptocurrency holders to secure cash loans by collateralizing their blockchain assets. Simultaneously, its financial services provide opportunities for indirect involvement in this new asset class. The company is committed to advancing blockchain’s thriving ecosystem around the world. SALT has a user base of 70,000 and currently operates in 10 territories. Founded in 2016, SALT is headquartered in Denver, Colorado. Please see www.Saltlending.com for additional information regarding products, restrictions, terms and conditions.